"Istorifik: Pidol's Kwentong Fantastik" presents "Mirabella: Ang Reyna Madrasta ni Snow White" starring Jasmine Curtis-Smith and Ruffa Gutierrez. 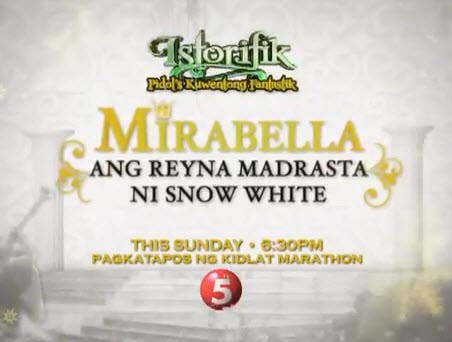 Don’t miss the Istorifik episode “Mirabella: Ang Reyna Madrasta ni Snow White” starring Ruffa Gutierrez as Mirabella and Jasmine Curtis-Smith as Snow White tonight at 6:30pm after the “Kidlat” marathon. The fantasy drama-anthology “Istorifik: Pidol’s Kwentong Fantastik” airs every Sunday on TV5.